8PM every Tuesday night at Bunga's Den in NYC. 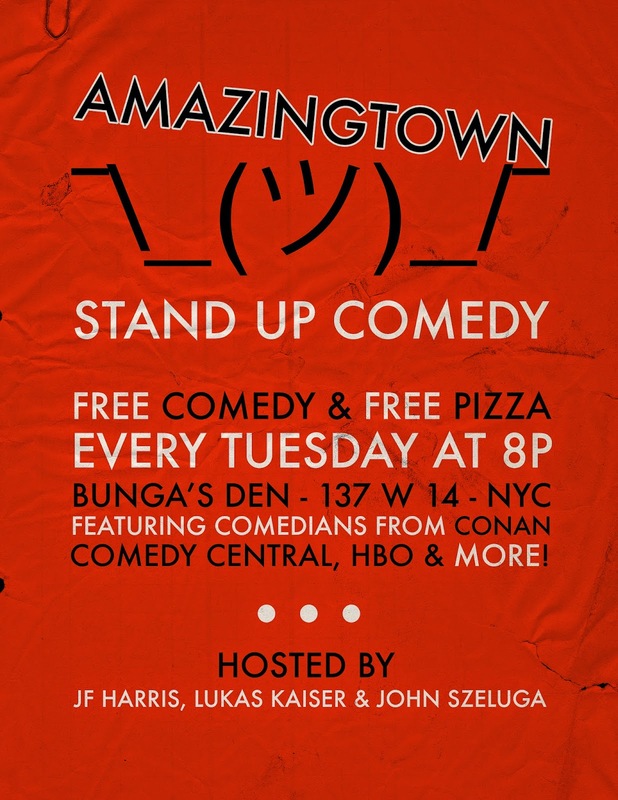 Lukas Kaiser, JF Harris, John Szeluga, and Sue Smith present Amazingtown Comedy - an evening of free comedy and free pizza at Bunga's Den, 137 West 14th Street, NYC. On the show this week: Joe Pera (Comedy Central), Jordan Klepper (The Daily Show), Sabrina Jalees (Last Comic Standing), and Giulia Rozzi (Bad Bride at UCB)! Lukas Kaiser hosts another night of stand-up comedy at Bunga's Den, and he's giving away free pizza! Come see some of NYC's best comedians at a fun bar with great drink specials. On the show this week: Kyle Ayers, Tom Cowell, Anthony DeVito, Greg Stone, Shakir Standley, Nimesh Patel, and Drew Dowdey! Amazingtown is a free weekly stand-up show produced by J.F. Harris, Lukas Kaiser and John Szeluga.